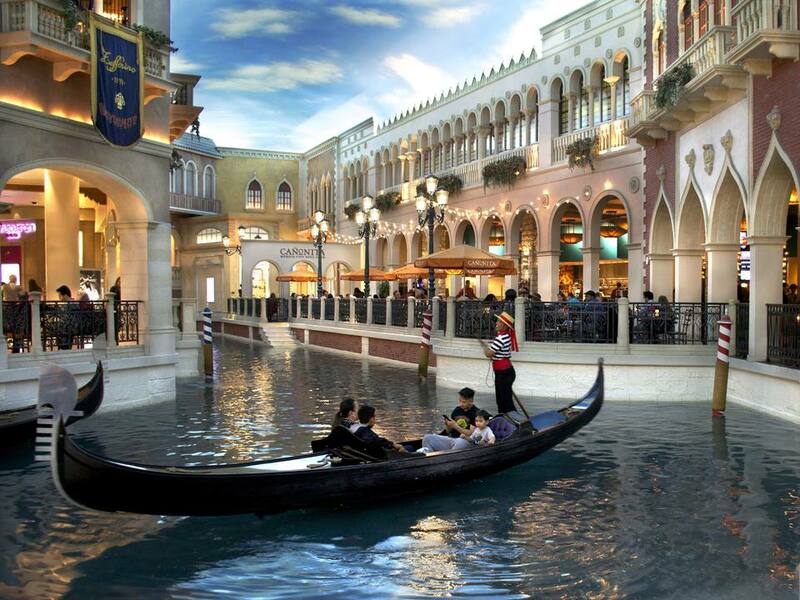 If you embrace the romanticism behind the singing gondoliers on the Gondolas at the Venetian in Las Vegas you will have a good time. If you focus on the sound and the person you are experiencing it with, you’ll take it in for what it is worth. You are not in Italy, you are in Las Vegas and that is what is part of the fun. You may be floating along a man-made Italian Village that doubles as a mall or outside under a bright blue southern Nevada sky but take in the moment and you’ll forget that you have wanted to go and experience this in Italy. Get a romantic ride through the streets of a mall. Exciting! Actually, it can be a lot of fun and so Las Vegas. The gondola glides past cafes and sidewalks and it is a good place to tell that special someone stories about how one day you will take them to Venice. At times it feels a little goofy to have this UNLV student singing to you but they do a good job. The gondolas make their way through the Grand Canal Shoppes as people line the canals and take pictures of you for no apparent reason. It can be very romantic though, so if you decide to try it, just imagine yourself under an Italian sky floating through hundreds of years of history. All kidding aside you will see people smiling, cuddling and completely immersed in the experience. The lines can be long to go on a ride so plan accordingly. 3377 Las Vegas Blvd, S.
Looking for a Few More Things to Do at Venetian/Palazzo Las Vegas? Chicken, Waffles, and Watermelon at Yardbird Southern Table and Bar. Need I say any more? Whiskey, whiskey and more whiskey at the Bar at Delmonico. With over 700 options and a knowledgeable staff to walk you through a mini-education in brown spirits.